Since its inception in 1998, the Sharmafund has focused on two types of programs. The first program provides scholarships for young, low-income indoor climbers to attend a week-long Yo! Basecamp Rock Climbing Camp. These scholarships are inspired by Chris' own experience as a 12-year-old gym climber, whose climbing gym community in Santa Cruz, California, helped finance his participation in national climbing competitions, and also took him on numerous outdoor climbing trips. Recipients of these scholarships must go through a rigorous application process, which includes writing four personal essays, obtaining two letters of recommendation, and showing proof of financial need in the form of tax returns. The kids who receive these scholarships are positive and hard-working. Without the aid of the Sharmafund, they would not be able to afford Yo! 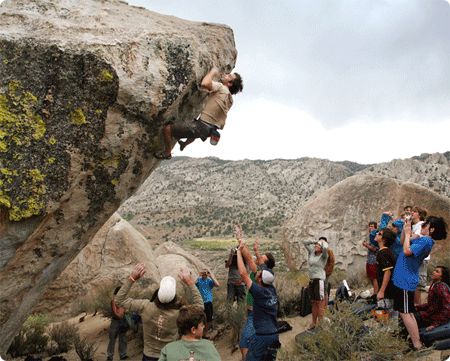 Basecamp's extremely educational, transformative outdoor climbing experience. If you are involved with an organization that works with underprivileged kids, please contact us to to find out more about getting involved with this program.